Gastroparesis, a condition in which the stomach digests food too slowly or not at all, can develop as a side effect of diabetes, digestive surgery, cancer treatments, eating disorders, endocrine or neurological problems or certain medications. If you have gastroparesis, your doctor will place you on a diet that doesn't strain your digestive system. Smoothies can play a part in this diet, but they may not be appropriate for all gastroparesis patients or for all stages of your recovery. Talk to your doctor about how and when you can include smoothies in your diet before drinking them. The typical gastroparesis diet is divided into three or four phases that transition gradually from full liquids to soft, easily digested foods. The phase you're on is determined by what you're able to tolerate. According to the Cleveland Clinic, the diet's most basic phase allows only clear liquids; no type of smoothie can be consumed during this phase. When this phase is tolerated, the next allows sugar-free "full" liquids like milk, plant milk, protein shakes and yogurt-based smoothies. Do not advance to this phase until your doctor or dietitian recommends it. A smoothie appropriate for the full liquid phase of the gastroparesis diet is not the same as one you may get from a restaurant, juice bar or coffee shop. These smoothies should consist primarily of fluid and yogurt. The yogurt can be fruit-flavored, made from regular or plant milk, sugar-free, frozen or in the form of kefir, but it cannot contain chunks of fruit or ingredients like granola. Use milk, plant milk, water or juice as the fluid. For additional flavor, add extracts such as vanilla or almond extract, fruit syrup, flavored gelatin powder or pudding mix. To give the smoothie a thicker consistency, you can blend the mixture with ice or with frozen, very ripe bananas. A person who has gastroparesis needs to limit fiber. That's because fiber may further slow the stomach's ability to move food through the digestive system and exacerbate symptoms. While you're on a gastroparesis diet, do not add high-fiber fresh fruits or vegetables to your smoothies, particularly berries, apples, oranges or tomatoes. Other than frozen bananas, the only type of fruit you can include in the smoothie are pureed peaches, peeled and pitted. Don't add in any dried fruits, nuts, seeds, nut butters or whole grains like oats or wheat germ. 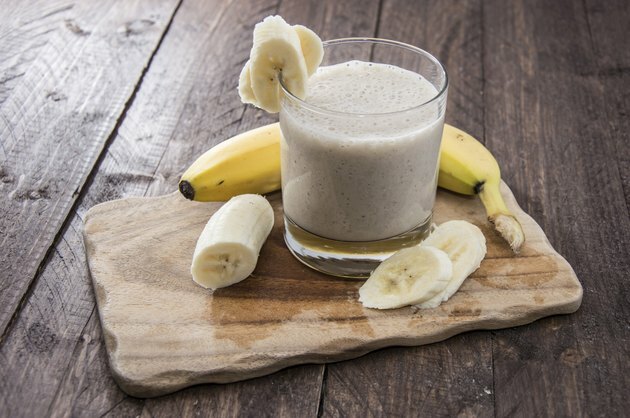 A good, basic smoothie combination for patients with gastroparesis is a blend of 1/2 cup of smooth, fruit-flavored yogurt with one small frozen banana, advises the University of Virginia Health System Digestive Health Center. Thin with orange juice, milk or, if you need to increase your protein intake, whole milk that's been fortified with nonfat instant dry milk. Use 1 cup of the dry milk powder for every quart of regular milk. Other options include equal parts strawberry, raspberry and blueberry yogurt blended with regular milk, or rice milk combined with frozen bananas, strawberry yogurt and lemon juice. Gastroparesis patients who are diabetic will need to monitor their blood sugar carefully when they include smoothies in their diet. They may need to opt for sugar-free ingredients and reduce or eliminate the canned fruit, bananas and fruit syrups from their smoothie recipes. A diabetic should contact her doctor immediately if she notices fluctuations in her blood sugar. Individuals who've developed gastroparesis due to bariatric surgery will also need to be careful consuming smoothies since they are not permitted any form of sugar while on the diet. They should avoid fruit and use only products that are either unsweetened or that contain sugar substitutes. What Fruits Can You Eat After a Gastric Bypass Surgery?